Aleah Bowie '13 (from left), Janell Holloway '13, and Raven Fisher '13 sampled chocolate during a class that introduced the political side of the sweet treat. Back in January, as she headed to teach the first class of her new undergraduate course, “Chocolate, Culture, and the Politics of Food,” Harvard College Fellow Carla D. Martin wondered whether it would resonate with students. Those fears proved unfounded. 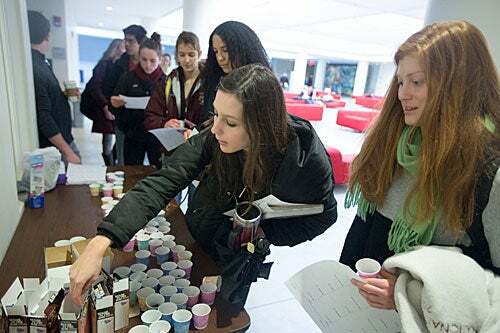 More than 170 students are now delving into the rich subject, enjoying in-class tastings of different varieties and brands of chocolate — and exploring the darker side of its production. During a recent tasting, Martin distributed squares of three varieties to the class. In an exercise akin to a wine tasting, she encouraged the students to consider several aspects of the treat. She asked them to observe the surface, noticing the color and whether the square was matte or glossy, then had them break the chocolate in half and note the snap that it made. Well-tempered chocolate with high cacao content makes a sharp, crisp sound when broken, Martin said, while chocolate with high milk or sugar content makes a much more muted snap. Today slavery, forced labor, and hazardous child labor still exist in some West African nations, which produce three-quarters of the world’s cacao, Martin told her students. When it came time to taste the chocolate, Martin counseled the students to let it dissolve on the tongue and catalog the variety of tastes they perceived as it melted: whether the first flavor they perceived was sugar, for example, or milk. After the tasting, Martin talked about the legacy of slave labor in the production of cacao, offering a case study of challenges faced by the Quaker-founded Cadbury Co. in the early 1900s, when such labor was discovered on the cacao plantations of the island of São Tomé, off the West African coast. Despite the Quakers’ abolitionist roots, it took nearly a decade for the company to relocate much of its cacao production to West Africa’s Gold Coast. Today, Martin said, slavery, forced labor, and hazardous child labor still exist in some West African nations, which produce three-quarters of the world’s cacao. According to Anti-Slavery International, 284,000 children work in hazardous conditions on cacao farms, and as many as 15,000 of them have been enslaved through human trafficking. Martin then informed the students that the genteel brands of chocolate they had just spent so much time tasting, assessing, and enjoying were made from cacao sourced from West Africa. As the students realized the implications, a stunned silence stretched across the room. In a previous guest lecture, Kellie Carter Jackson, Harvard College Fellow in African and African American Studies, had told the class that the connection between chocolate and slavery extended even beyond cacao, all the way back to slaves working on sugar plantations as early as the late 1600s. The connection between slavery and sugar is just as strong, Carter Jackson said, as sugar’s connection to chocolate. That’s because the sweetness often associated with chocolate doesn’t come from cacao. Martin noted that the primary ingredient for many popular chocolates isn’t cacao, but sugar. As Easter approaches, however, chocolate lovers need not despair. Increasingly, artisanal chocolate makers are creating ethically produced chocolates. Representatives of two local chocolate makers, Taza Chocolate and Rogue Chocolatier, will speak to Martin’s class later this semester about the joys and challenges involved in producing high-quality chocolate untainted by unfair labor. For Martin, chocolate’s disturbing roots help her to better understand not only the history of one of the world’s most beloved treats, but also people’s complex relationship to it. Her devotion to chocolate is well documented. 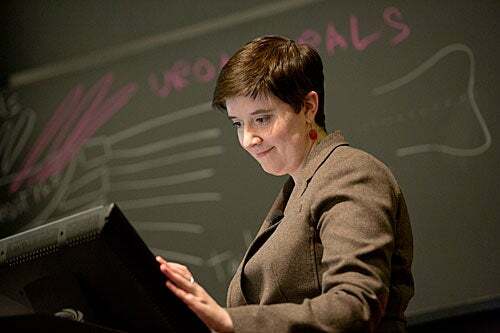 She tweets about it, blogs about it, and developed a 2012 Wintersession course for graduate students on the subject. That class evolved into the current undergraduate course. Nora Abo-Sido ’13, who originally thought of the class as “a fun elective,” said it’s become something more. While much of the curators’ work involves preparing objects for display, there remains a great deal of behind-the-scenes work on hundreds of pieces that might not make it onto the new building’s walls. Lisa Anderson, Frederick Randolph Grace Assistant Curator of Ancient Art, described a project to catalog and digitize the museums’ collection of ancient bronzes, including roughly 1,250 objects that ultimately will not be displayed.